In the world of binary options trading you will encounter many unfamiliar words and terminology that is not normally used in everyday parlance. Most are English words and are also used in ordinary option trading. In this binary options glossary, you can find the meaning of most words and concepts from the world of (binary) options. Anyone who is good at predicting the future price of a stock, market index, commodity or foreign currency, can make a lot of money with binary options. 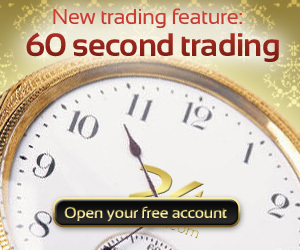 Have you already tried your hand at binary option trading? If not, then we have an attractive offer for you: start trading in binary options now and get 100% bonus on top of your first deposit. Do not wait and become a successful binary options trader! An American option is a type of 'normal' (not binary) option that can be exercised at any time until the expiry date. This is in contrast to an European option. A (binary) option is 'at the money' if the price of the underlying asset is exactly equal to the strike price. A 'normal' option at the end of the term 'at the money', has the value 0. With binary options brokers rely on whether the option pays a return, has become worthless, or refunds (a percentage of) the original deposit. It is rare that a binary option ends 'at the money'. A binary option is a derivative financial product with only two possible outcomes: profit or loss. The outcome depends on whether the price of the underlying asset is below or above the strike price ('high/low '), falls within or outside a certain bandwidth ('in/out'), or a particular rate, especially before the expiration date ('touch/no touch'). Read more in the article 'What are binary options'. A boundary option is a type of binary option whereby you must predict whether the price lies within or outside a certain bandwidth on the expiration date (English: "range"). If you predict this correctly, the option pays returns in advance; If wrong, you lose your deposit. A call option is a 'normal' (not binary) option that gives you the right to buy one share (or other underlying asset) at a predetermined price (the strike price). Sometimes with binary options the term call is used for a higher option. Early closure of a binary option means that the option ends before the term is over. With early closure you get part of the predetermined return or you collect a part of your loss, depending on whether the price of the underlying asset is higher or lower than the strike price at the time of termination. A European option is a type of 'normal' (not binary) option that can be exercised only on the expiration date itself. This is in contrast to a American option. The expiration date is the end of the term of a (binary) option. It is clear at the time of expiration that an option has achieved its purpose and whether it pays a return. Because binary options often have a short maturity, from only hours or even minutes, also called 'expiration time'. Forex stands for 'FOReign EXchange' and refers to trading of foreign currencies (currencies). Forex trading is a profession in its own right and there are whole websites dedicated to forex only (see for example Forex Coach, a good English website about forex trading). It is also possible to trade in binary options on forex trading. You read more about it here: 'what is forex?'. A high/low option is a type of binary option whereby you must predict whether the price on the expiration date is higher or lower than the strike price. If you predict this right, the option pays out the predetermined returns; If wrong, you lose your deposit. Binary options with a (much) higher return than normal. This type of options also usually has a (much) higher risk. A (binary) option is 'in the money' if the price of the underlying asset is at the right side where the investor had predicted. An option that is 'in the money' has a positive value. The term of an option is the period until the maturity date. During the term, the option has the chance to achieve its target price. The underlying asset of an option is the product to which the option relates (and whose return depends on the option). Traditionally, the underlying asset is a share, but nowadays there are also (binary) options on stock market indices, foreign currencies (forex) and commodities. A (binary) option is 'out of the money' if the price of the underlying asset is on the other side of the strike price than where the investor predicted. An option that is 'out of the money' at the end of the term, has a value of 0. A put option is a 'normal' (not binary) option that gives you the right to sell a share (or other underlying asset) at a predetermined price (the strike price). In the world of binary option, a lower option is sometimes called a put. The return on a binary option is the profit expressed as a percentage of the purchase price. Most binary options have a return between 60% and 90%. A rollover at binary options is the conversion of an existing option into a new option with a later expiration date. This usually commands a transaction fee, but gives you the possibility to give a losing option 'new opportunity'. A touch/no touch option is a type of binary option whereby you must predict whether the price of the underlying asset, will especially reach a certain price or not at any time before the expiration date. If you predict this correctly, the option pay out the predetermined return; if wrong, you lose your deposit. It is always like this with this type of binary option no matter what the price is on the expiration date. The exercise of an option is to use the right that the option offers to buy or sell the underlying asset. Many option traders do not actually exercise their options, but sell them at a profit before or on the expiration date. Binary options cannot be exercised because they do not give the right to buy or sell the underlying asset, but only pay a predetermined rate of return. The strike price of a 'normal' option is the price at which the underlying asset may be purchased (in the case of a call option) or sold (in the case of a put option). With binary options, the strike price is the price above (or below) which the option pays a return. Is there a concept missing in this glossary? We have done our best to put together a comprehensive list of words, concepts and terminology about (binary) options. However, it may be the case that we have overlooked something. Should you find that there is a term or concept missing from this binary options glossary, please do not hesitate to let us know by using the contact form, and we will see if we can add that term or concept to the list.